RAMPS for Aging In My Place ramps are a great way to unite families. Quick and easy you can count on RAMPS for AIMP to protect your loved ones. Our services do not alter your home or property so when your rental is complete you will never know we were there. Please call 248-383-5767 to request a quote or use our online forms to take pictures and measurements then email that information to us. We can quote from that. Our customers don't always know how long they will need a ramp in place. Their injuries or challenges may not be predictable. 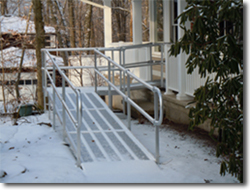 Sometimes visitors require accessibility ramps to visit a home, business, or school. Our ramp solutions can keep your visitors safe and make them feel welcome by allowing the visitor to enable their own mobility. Ramp rentals allow our customers to respond quickly to their guests or loved ones needs without rushing the evaluation of purchase benefit. Our customers appreciate the opportunity to act and safeguard those they love while reserving time to clearly evaluate the purchase decision. Our ramp experts can help. They can provide all the information you require and recommend a course of action. With the home work done you will feel relaxed reviewing and making final determination of your decision. As a general rule, rentals that last longer than 6 months provide less value then outright purchase. Here again we have you covered. Should you elect to purchase we will convert and apply up to 75% of your rental fees toward the purchase price of your ramp solution. This assures you the best available value on an already affordable solution. So please do not hesitate to welcome all those you love into your home and events by enabling a dignified, safe entryway. Holiday ramp rentals are a meaningful and appreciated way to express our love for one another. More than other gifts our attendance at holiday affairs holds value for years to come for all participants. We may not remember the neck tie or perfume but we can and do remember each other's conversations and laughter. Aging or injury need not end these valuable experiences. Let RAMPS for AIMP identify and remove any accessibility barriers to the creation of these wonderful memories. Our professional staff will access your needs and suggest a solution. Be assured your guests will greatly appreciate your thoughtfulness in enabling them to join in festivities while maintaining dignity and personal value. Can provide an affordable wheelchair ramp rental solution for periods as short as a day in whatever configuration you require. Rentals include the setup/take down charge and the ramp rental charge. Please contact us at 248-383-5767 or fill out our RAMP MEASUREMENT FORM to receive an approximate cost over the phone. A ramp expert can also be scheduled to professionally measure and access your need.